I love January! It’s a time to set fresh goals, to reevaluate life, and to attempt to micromanage my own and everyone else’s schedules. For years now, I have come up with plans every January to teach my children to “work hard” and “do chores”. I have come up with more elaborate chore chart systems than I care to admit, and I have failed to be consistent with any of them because they were too complicated. 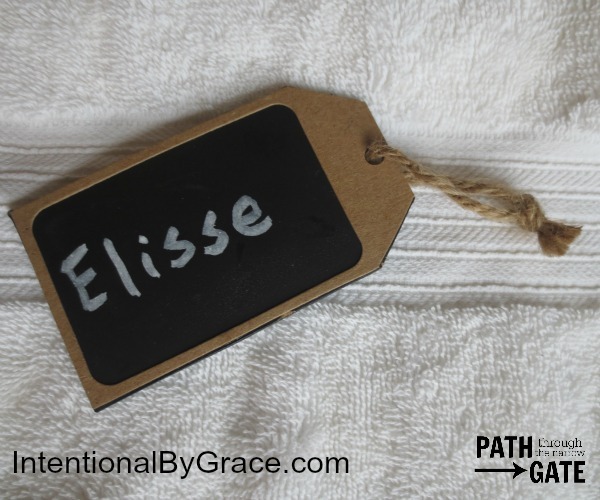 I picked up some “Chalkboard Tags” from the dollar bin at Michaels (you can find these anywhere right now, even large grocery stores!). I wrote one of my kids’ names on each tag with a chalk marker. Any kind of name tag would work for this system. 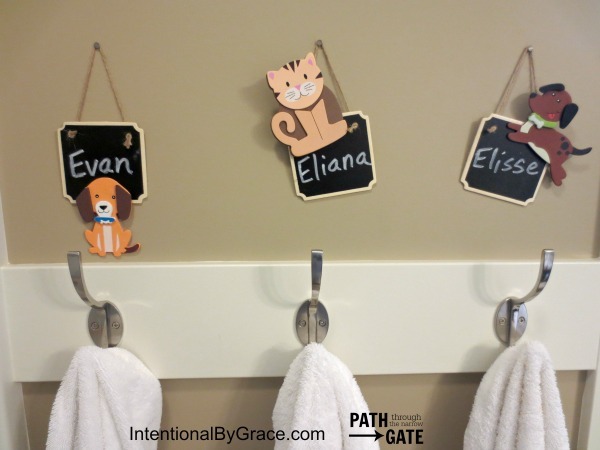 Because I have three kids, I decided to hang these tags in three areas of our home which represent three major chore areas: Kitchen, Kids’ Bathroom, and Laundry Room. If you have more children, you could add more areas of the home and corresponding chores. While the child’s name is hanging in that particular area of the house, he is responsible for the “family” chores that come out of that area. The key word here is “family” chores. For example, just because Sammy is assigned to the bathroom for the week, he is not responsible for hanging up Sally’s towel. Sally is still responsible for her own towel, her own clothes in the hamper, her own bed made, and her own toys picked up. The tags are then rotated once each week. 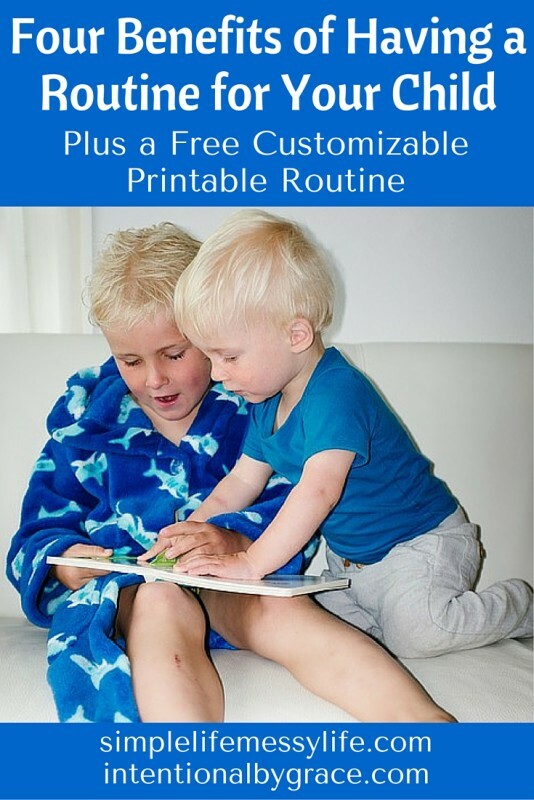 For this system to work, you need to come up with a list of age-appropriate chores that need to be done in each area on a daily/weekly basis. I used dry erase contact paper to write out the chores that needed to be completed for each area. 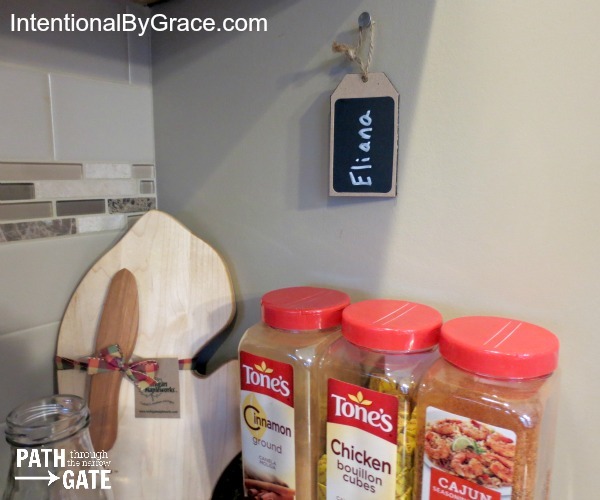 The chores are written in permanent marker so that the kids can check the items off with a dry erase marker when they finish it. When the week is over, we erase all of the marks but the chores are still on the sheet ready to go for the coming week. 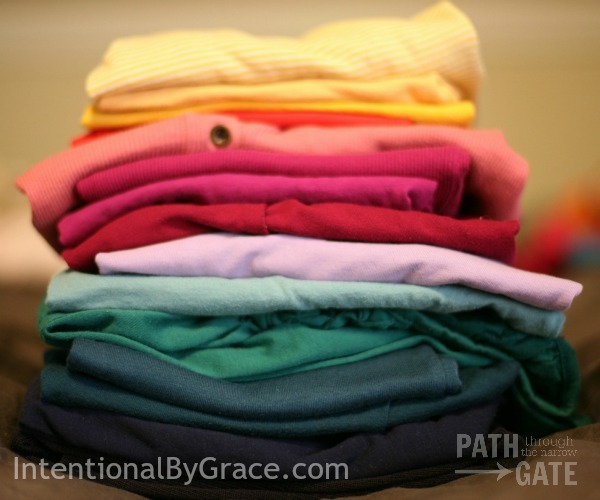 If you have kids of different ages, you could color code the chores so that 5 y.o. Sammy does the blue chores and 9 y.o. Sally does the red chores. The beauty of the dry erase contact paper is that it can be applied to the inside of kitchen or bathroom cupboards or onto the outside of your clothes washer. 1. Follow-up: When I am in the kids’ bathroom and notice dirty counters, I can easily look at the tag and know who needs to be reminded to get the chore done. 3. 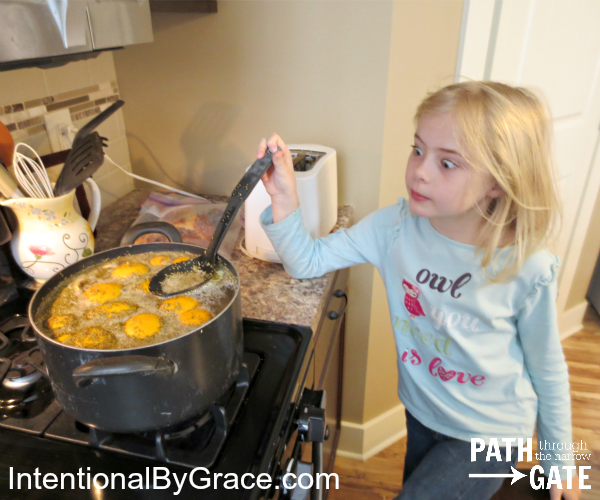 One-on-One Time: Only one child is assigned to be in the kitchen with me each week, and my kids have enjoyed the one-on-one time. We have smelled spices together, talked about what goes into our food, and had some great conversations while making dinner. 4. 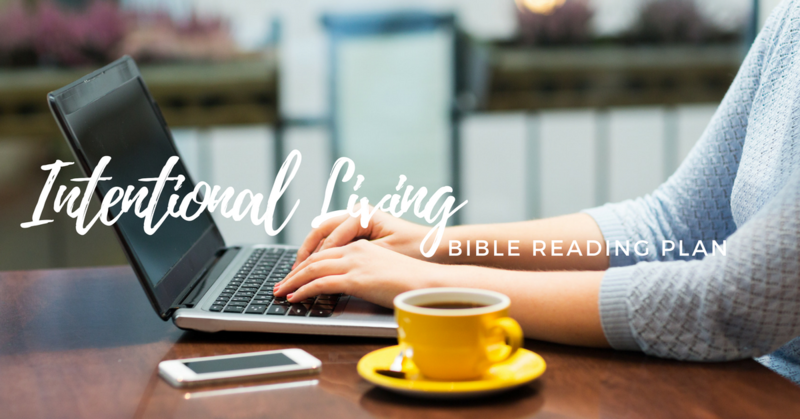 Healthy Pride in Accomplishment: When I do chores for my children, I am denying them the joy of discovering how much they are capable of doing themselves and how much they can contribute toward a working household. When I give my children some room to do the chores themselves, they see how much they are capable of doing and how their work contributes to helping the family. 5. 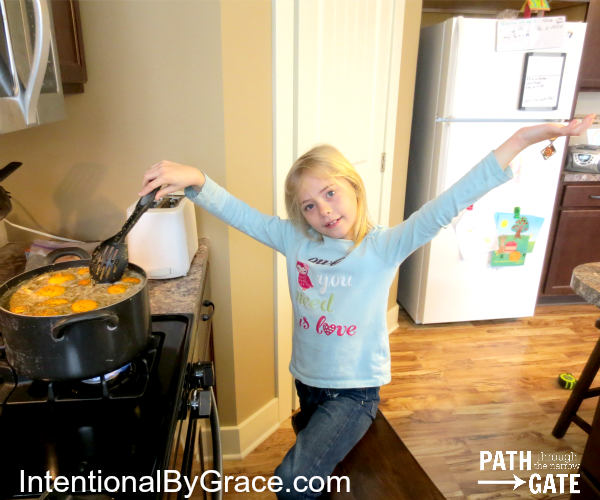 Attitude Change Towards Chores: In the past, I have looked at chores as a way to teach my kids to “work hard” and to help me accomplish housework. These are both important and valid reasons for having kids do chores. But, I am now trying to look at chores as an opportunity to teach my kids important life skills. This may mean that one night I empty the dishwasher while my child reads the recipe, browns the ground beef, opens cans, drains the beans, and makes chili for dinner. A couple of weeks ago, my nine-year-old daughter was in charge of the laundry. She reminded her siblings that it was Tuesday and that they needed to bring their bed sheets down to the laundry room. When I came down to the laundry room to help her start the machine, I found that it was already in progress. She was standing there with a big smile on her face, explaining how she had started the machine by herself. In that moment, my mother heart swelling with pride, I realized that I need to let my kids grow up a little bit. I need to stop micromanaging. Did my daughter get the “perfect” amount of soap into the washing machine? I have no idea! But, she proved that she was capable of doing more than I had given her credit for. And the washing machine didn’t explode with soap bubbles. And the sheets smelled good after the load was finished. I need to back off. I need to let my kids grow up and see how capable they truly are. And that is what this ridiculously easy chore system is helping me to do! How about you? 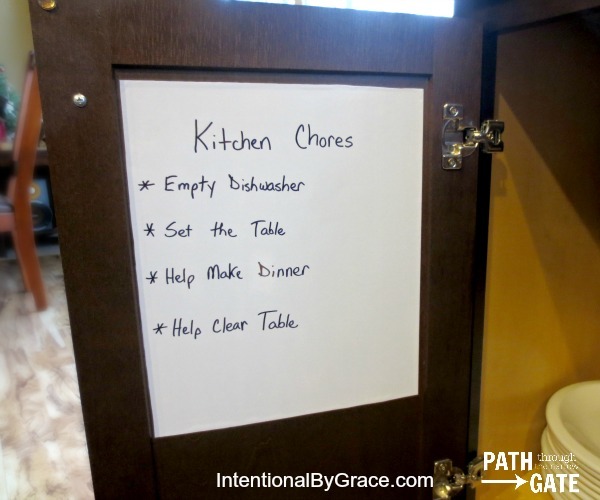 Do you encourage your kids to do chores? Why or why not? 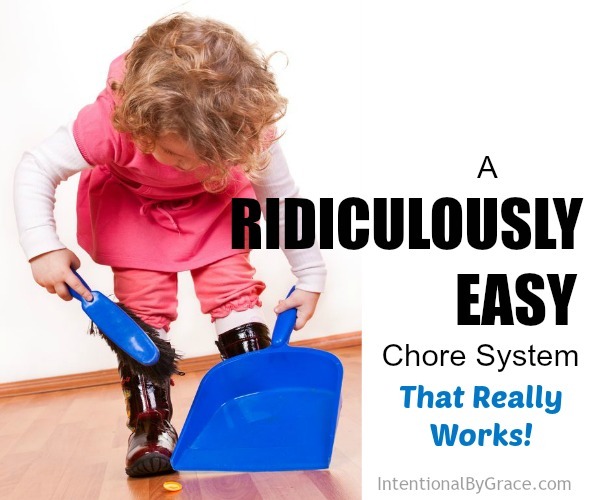 Do you have any questions about or suggestions for this ridiculously easy chore system? I would love to hear from you! Please scroll down to comment. I LOVE this! I too have tried a variety of systems, but haven’t really stuck with anything. I really like the idea of changing it up weekly (less to remember) and having a list of age-appropriate tasks. None of my kids can read yet, so they will still need some direction, but I’m sure it’ll get easier the longer we do it. Thank you for such a helpful post! I’m definitely pinning and sharing this!